Begin at SR 54 and US 41 in Land O' Lakes. Head north on US 41 to Ehren Cut-off (route 583) and take a right. Now take route 583 up to SR 52 where you want to turn right. Take SR 52 (east) and turn left on Bellamy Bros. Blvd. Take Bellamy Brothers Blvd (north) to Hayman Rd where you want to turn right (go east). Take Hayman Rd till you get to Spring Lake Hwy where you want to take a left (north). Take Spring Lake Hwy north, cross the SR 50 intersection and the road will change names to Mondon Hill Rd and it will turn left (now heading west). Shortly after the turn, look for Weatherly Rd where you want to turn right (now heading north). Take Weatherly Rd. up to Croom Rd (AKA route 478) and take a left (head west). Take Croom Rd. till it intersects with US 41 and turn right (head north). Take US 41 north until it intersects with SR 476 (AKA Lake Lindsey Road) at which point you need to take a right (you'll head east). Take SR 476 until you get to CR 439 where you need to take a left (head north). CR 439 changes names to CR 39 which you want to stay on heading north until you get to CR 48 where you want to take a right (you'll start heading southeast). Very quickly you'll see E. Trails End Road which you want to take a left on to. Take this until you get to S. Withlapopka where you want to take a left. Now stay on Withlapopka till you go over the bridge and come to E. Gobbler Dr where you want to take a right. Take E. Gobbler Dr. all the way till it intersects again with US 41 this time in Floral City and the route's end point. This is a very rural ride, that spends a lot of time crossing scenic pasture land and forested areas. One of the best motorcycle roads in all of central or southern Florida. Rolling hills and sweeping curves. You would have to travel north for a better ride. Plenty of gas stops, stores, etc. along the way. Sleepy Hollow restaurant and fish camp is a very biker friendly destination. At the intersection of Spring lake Hwy. and SR 50 there is a convenience store that all bikers local to the area stop at for water and bathrooms. After turning on CR 439 in Istachata, be sure to check out the old Istachatta General StorePost Office. on July 10, 2010 5 out of 5 members found this review useful. Very nice biker bar off of 39A. Airboats and a great lunch. Be careful on the twists on 39A they are very fun but sharp. The bartender said they lose a bike a week, so go slow your first time through the loop. on November 26, 2011 3 out of 3 members found this review useful. My ex-Gf lives up in Floral City and we used to hit Gobbler all the time. What a great little stretch of road! Lots of Harleys down at Sleepy Hollow. I'd say an excellent little run for either sport or cruiser type bikes. My reccomendation to younger riders like myself (or anybody for that matter), go slow the first couple times. Once you're more familiar with the roads then step up your pace responsibly. A couple corners can put you in the dirt if you're not careful. on December 28, 2007 2 out of 3 members found this review useful. Thanks for the ride. We completed it yesterday & enjoyed every minute of it. After living in Florida for 20-years, were very surprised to find these out of the way places we've never visited. Thanks again... it was worth every minute of the trip! Started the ride at SR52 and Bellamy Bros. At the end of ride at US41 turned south to 480 (E. Stage Coach Trail) and took that to US19 Then south to Hudson. 480 is 17 miles long and nice and hilly with some sweepers. on June 12, 2017 0 out of 0 members found this review useful. Did this ride with about 15 bikes - nearly all Indians. We actually started this ride from a restaurant in Tampa which added a few miles to the day. It was fun and easy riding the entire way with lots of rich Florida scenery and very little traffic once we cleared the Tampa area. Once you're on Gobbler Drive you'll slow down a bit because of the winding turns which are easy to negotiate. 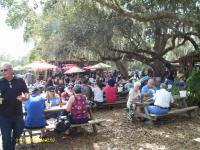 The Sleepy Hollow Restaurant is very biker friendly with live music on the weekends and a good, friendly crowd. Enjoy the food, beverages and music. Ride safe. on December 5, 2010 0 out of 2 members found this review useful. This ride was a ton of fun! I broke off from the suggested path at Brooksville to take the green swamp route also listed here and had a great time between the two. There were a sh*tload of harleys at Sleepy Hollow Bar. on August 15, 2010 0 out of 0 members found this review useful. Completed the trip yesterday, except mine started in the Space Coast, A1A (on the beach) It sure didn't feel like I was in Florida on that route. lot nice views Round trip for me, was 398 miles.